If you’re looking for a cozy and spacious abode for your family, you’re in luck! Morton Buildings has the perfect house for you; With its exterior painted with grey and white and a classic structure, this steel bungalow certainly has a classy look to it! The house has a beautiful wrap around porch that gives you the perfect view of the night and starry skies or the rising sun. It has a large garage, located at the back of the house, and a spacious open parking area near the underground basement. The interior of the house gives off a warm aura and makes you feel immediately welcome, thanks to the pastel color and the illumination, which ensures the room is well lit at all times. The house also includes a well-sized living room coupled with a beautiful fireplace, which makes this the perfect place to hang out and relax while bonding with your loved ones during the Holidays. The kitchen has an L-shaped structure that makes things accessible for people who love to cook and lets you oversee the dining area and the living room, so you can make sure you never miss any memories inside your home! Just like the rest of the house, the bedrooms are spacious and homey, giving you plenty of space to decorate and to unleash the creative genius within you. 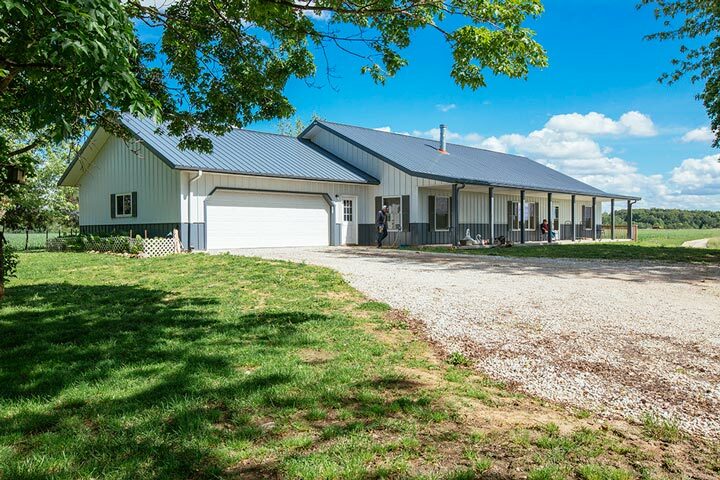 If you crave a homey and warm atmosphere, this metal building home is the right place for you! Plan: contact Morton Buildings, project number: B037026886. It may not be that roomy, but this room exudes comfort for its occupants.